Some other suggestions on the same site include Bell Pepper Jelly, which also can be used as a sweet and sour sauce by adding garlic. How much sauce do 6 lbs. make? 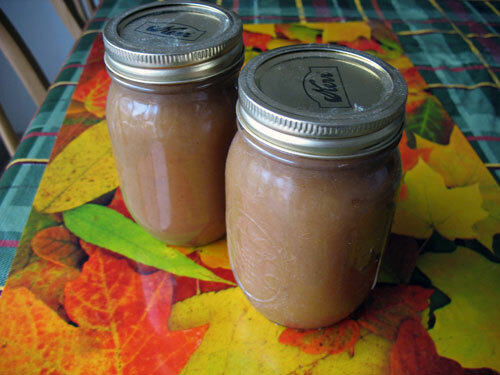 I've got some applesauce made from apples left over after making juice and would love to make butter with it, but I haven't got a clue about the number of lbs. of apples I had to start off with. The juice is absolutely wonderful on its own, but I hate having to waste the rest, though I could use it in a cake. My recipe for apple butter is 8 cups of sauce, 3 cups of white sugar, cinnamon and clove and nutmeg to taste. (I have also used just allspice to good effect, instead of the other spices. Put in slow cooker and cook about 6 hours on high with the lid slightly open. I use the same recipe for pear butter and peach butter. Also for pumpkin butter, but use pumpkin pie spice. The original recipe called for 4 cups of sugar, but I found that is way too sweet, especially with some of the ultra sweet fruit I was getting. I haven't got a slow cooker which is why Floyd's recipe intrigued me. I guess I could take a shot at it and just add sugar and spice to taste. I make pear and apple and bake mine in a roaster. Depending on the amount but slowly it takes around 5 hours. I just core and peel the apples and they fall apart into applesauce. I remove the top about the last hour for thickening but I have to keep an eye on it. I think the cook times vary due to different water contents in the apples. Put everything into a heavy pot (I use the same enamel pot I use to make NYT no-knead bread) and bring to a boil on top of the stove; be careful, it splats! At this point you can either cook it on the stove top, stirring constantly to avoid scorching (happens easily), or put the pot, uncovered, into a 300 F oven. You'll still need to stir it every once in a while, as a skin tends to form, but it just stirs right back in. That sounds wonderful, especially with the maple syrup! It's just the sort of thing I was looking for. I am glad you mentioned the "splat" from the apple butter. It sticks like glue on the skin and can raise a nice blister. I also use a heavy enameled pot to cook mine in because it doesnt take as long to thicken, but does require pretty close attention. Oldcampcook; it seemed odd to refer to it as boiling, as it really just sits there and bloops and splats. My 11 year old refers to it as the "Bog of Eternal Stench" phase of cooking, referring to Labyrinth, (an old David Bowie movie from the '80's), not the smell. You might want to try the oven method to avoid the scorching. But I don't mind. I'm just thrilled with the recipe and intend to make it the minute I have enough applesauce, though come to think of it, there's some in the freezer I could add to what I've got. I was given a steamer-juicer recently; it makes beautiful juice, and I simply put what's left through a food mill for the applesauce. This way nothing goes to waste. Mind you, I'll need more jars, having just made 8 jars of pomegranate jelly. Pomegranate jelly, wow! That sounds incredible; is it good on meats, etc, or more of a toast and jelly thing? We put it on toast or scones, and my sister puts it in her trifle every year. It is tart, a little less so than red currant jelly, but absolutely delicious. When people find out that I make it, they line up with orders for Christmas as we've yet to see it in any stores. I made Pomegranate-blueberry hot pepper jelly a couple of weeks ago and it is simply to die for! I just used the juice concentrate sold in the grocery freezer section and my own fresh hot peppers from the garden. I was interested in your comment about using a roaster for the apple butter. I just bought one of those big roasters which I have used for baking bread. What temp do you set the roaster at? I can sure cook at lot more at a time in the roaster than I can in my crock pot or the enameled pot combined. at 250 F and covered it takes around 4-5 hours. Depending of course on your oven, amount of apples and the moisture content in the apples. Note: I am certain you could do it at a higher temp. It has always been easier for me to leave it. I allow it to bake for a while and it seems to break down the apples easier and intensifies the flavor. The long cook period would be no problem. And using the roaster would free up one burner for an additional water bath pot, so I can can more at a time. Already called the SO and told her that would be the plan for next summer! All these posts about Applebutter were too much. 3lbs apples (I used 1/2 honeycrisp and 1/2 golden delicious). Do not peel or seed - just cut into quarters. Put through food mill to create pulp. Place in warm, clean jars and process in hot water bath for 5-10 minutes to ensure a good seal. Mmmm! I'm not sure if I would include the nutmeg in future batches, but I did like the flavour of the allspice. Now to make the larger batch to add to my Christmas boxes.